Monk's Enlightenment Begins With A Marathon Walk In Japan last year, Endo Mitsunaga, a 34-year-old monk, became the 13th monk since World War II to complete the Sennichi Kaihogyo, 1,000 days of walking meditation and prayer around Mount Hiei. The distance is roughly equivalent to the Earth's circumference. Endo Mitsunaga is only the 13th monk since World War II to complete a grueling training regimen of walking around Japan's Mt. Hiei for a thousand days. Mitsunaga, who has earned the honorific daiajari as a result, is shown here in his living quarters at the Enryaku-ji temple complex atop Mt. Hiei, near Kyoto. Anyone who has run a marathon knows that feats of endurance require mental discipline -- a way to fuse mind, body and spirit. Perhaps not surprisingly, then, a monk at a Buddhist temple in Japan has walked a great distance -- roughly the equivalent of the Earth's circumference -- as a form of physical and spiritual exercise. On the side of Mount Hiei, overlooking the ancient capital of Kyoto, the wind whistles around a part of the Enryaku-ji temple complex. Inside, a small congregation of Buddhists recites sutras. 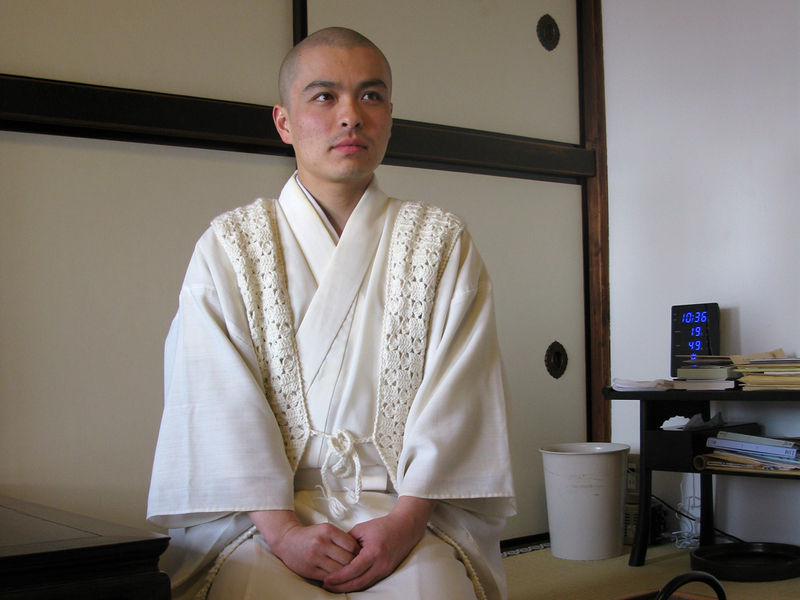 Leading the service is 34-year-old monk Endo Mitsunaga, who manages one of the temples in the complex. His hands flow powerfully and precisely as he wields ritual prayer objects and executes a series of mudras, or hand gestures, used in prayer and meditation. Last fall, Mitsunaga became the 13th monk since World War II to complete the Sennichi Kaihogyo, 1,000 days of walking meditation and prayer over a seven-year period around Mount Hiei. He walked 26 miles a day for periods of either 100 or 200 consecutive days -- a total distance about the same as walking around the Earth. In his living quarters, Mitsunaga kneels on the tatami floor mat and pours green tea. Walking meditation is like sitting meditation, he explains. The participant must maintain a calm mind, good posture and steady breathing. "As we walk, we recite the mantra of the Immovable Wisdom King, our principal deity," Mitsunaga says. "We're not supposed to be out of breath when we walk uphill. By reciting the mantra, we can first control our breathing and then control our mind." Fudo Myo-o, the Immovable Wisdom King, is an important figure in Japanese Buddhism. He is a wrathful-looking guardian spirit sitting amid flames, dressed in rags, and holding a sword and rope. On his walks, Mitsunaga carries a fan and a rosary, representing the sword and rope. He dresses in white, the color of death in Japan. On his feet, he wears only straw sandals. 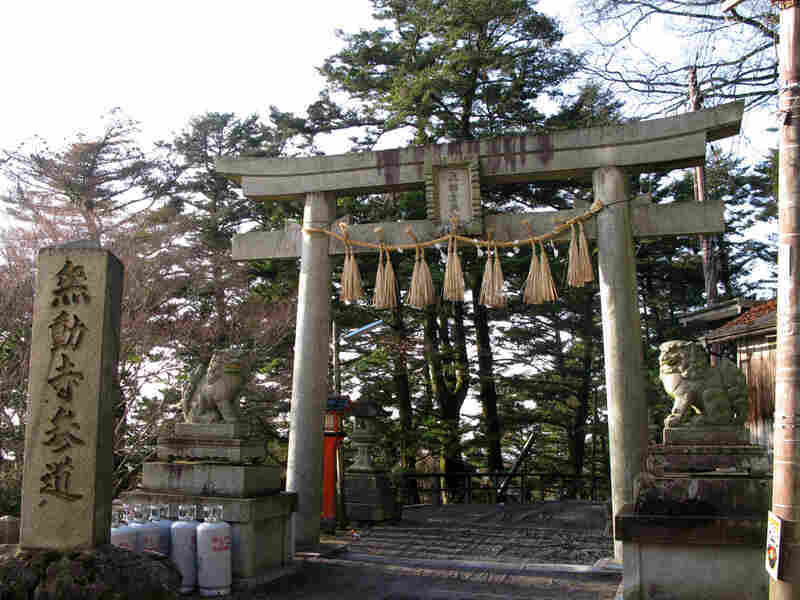 Robert Rhodes, an expert on Japanese Buddhism at Otani University in Kyoto, says the Kaihogyo tradition is unique because it takes a tradition of spiritual retreats in the mountains and turns it into a sort of circular pilgrimage. "The people who are doing the Kaihogyo are not just walking around the mountains," he says. "They're actually doing a pilgrimage and giving prayers at ... about 260 places on the mountain." The Kaihogyo is often described as an ascetic practice. Mitsunaga says it's really not that hard. A lot of it is just learning to manage time. "My walking prayers take up less than half of the day," he points out. "Anyone can do that. But the rest of my daily routine is also a part of my spiritual practice. I have to take care of the whole temple by myself, and it can take forever. If I don't do things quickly, I get no sleep." Practitioners of the Sennichi Kaihogyo, the 1,000 days of walking meditation, recite the mantra of Fudo Myo-o, the Immovable Wisdom King. This archway is near the Mudoji temple, which is devoted to Fudo Myo-o, the principal deity of the monks at Enryaku-ji. During the Kaihogyo training, Mitsunaga got up at 12:30 a.m. and walked from 2 a.m. to 8 a.m. Monastic routines and household chores took up the rest of the day. He slept for 4 1/2 hours a night. After 700 days, the Kaihogyo practitioner faces what Mitsunaga calls an exam. He enters a hall and prays nonstop for nine days, without eating, drinking, sleeping or even lying down. It's a near-death experience, the monk says. "Put simply, you just have to give up everything and pray to the Immovable Wisdom King," he says. "By doing this, he may recognize you and allow you to live for nine days." The practitioner interrupts his prayers every night to come to a small fountain and get an offering of water for Fudo Myo-o. Toward the end of the nine days, the practitioner is so weak, he must be supported by fellow monks. Finally, his old self dies, at least figuratively, and he is reborn to help and lead all beings to enlightenment. Mitsunaga pauses, struggling to find the words to describe his transcendental experience. Finally, he says that his fast helped him realize this: He is interconnected with everything else; independence is simply an illusion. "Everybody thinks they're living on their own without help from others," Mitsunaga says. "This is not possible. I really think that others have done something for me, and I have a feeling of gratefulness to other people." One lesson of the Kaihogyo is that in order to help others, you have to first train yourself. Rhodes says that dividing the Kaihogyo's 1,000 days into 700- and 300-day phases is a way to determine how much time to devote to cultivating yourself and how much to spend to helping others. He says the 70-30 split is based on the different stages of becoming a Buddha -- of which there are 10. "The first seven are working for your own benefit, cultivating your own mental attitudes," Rhodes explains. "And from the seventh, eighth and ninth stages, you're not only working for yourself, but you're working for everyone else as well." Now, Mitsunaga spends most of his time training younger monks and tending to the spiritual needs of his small and mostly middle-aged or elderly congregation. After the service, a woman in the congregation remarks that in her frenetic life, moments when she can attain stillness are few and fleeting. But Mitsunaga's whole life, she says, just seems like a continuous state of pure mind. She says she learns this and so much more just from watching him move. The audio on this story incorrectly refers to Mitsunaga as a Zen monk. He belongs to the Tendai school, which is a separate denomination.